Punjab Deputy Chief Minister Sukhbir Singh Badal, today said that the species of Congress Party was on verge of extinction in India and loss of CM’s son in Tehri and scrapping through in Jangipur despite TMC’s tactical support was the trailor of Lok Sabha elections for the ruling UPA. Speaking to media persons after inducting Ajay Thapar, a close confidant of Union Minister of State for External Affairs Parneet Kaur and Captain Amarinder Singh and 101 Congress families at the residence of Shaginder Singh Sunny Aulakh, in the fold of Shiromani Akali Dal, Badal said that the people of this country were fed-up of price rise, revelation of new multi-lakh crore scam every second day and arrogance and disconcern of Congress leadership from the hardships of common public has forced the public to punish Congress Party. Predicting mid-term Lok Sabha polls, Badal said that UPA-II would not survive in the winter session of Parliament and its allies including NCP has already started shortlisting the candidates for next Lok Sabha polls. Badal said that SAD was fully prepared for Lok Sabha elections and was preparing to give inning defeat to Congress Party by SAD-BJP capturing all the 13 seats in Punjab. He said that Congress cadre totally demotivated and demoralised and SAD was flooded with the requests from Congress leaders, who were making beeline to join development oriented party SAD. Lashing at Rahul for deliberately denigrating the youth of Punjab by dubbing them addicts, Badal said that half read Congress General Secretary should have gone through the reports as it pertained to the study of a sample of 600 addicts of Amritsar district out of which 73% were in the age group of 16 to 35. Rebutting Congress Leader of House Sunil Jakhar, Deputy Chief Minister quipped that the study he was quoting must have been conducting on Youth Congress cadre as majority of them were high on the drugs. When asked about steps taken by Punjab Government to curb the menace of drugs, Badal said that BSF under Union Home Ministry has totally failed to check the inflow of drugs and narcotics from Pakistan Border and Punjab Police has redoubled its efforts by intensifying its war against drug lords. “More than 50% of National recovery was made by Punjab Police and that shows the commitment and efforts made by them,” he added. Badal said that he has ordered forfeiture and auction of properties of drug lords and more than 700 bad elements have already been arrested by Punjab Police.Asking Congress leaders not to shed crocodile tears on drug addiction and prove their sincerity by asking their Congress Government in Rajasthan to stop the legal sale of Poppy-husk that was being smuggled to Punjab. 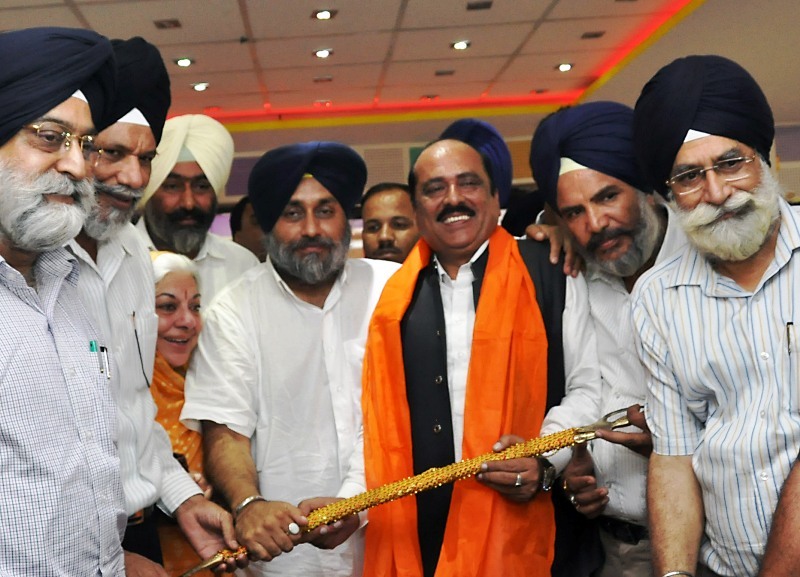 “Why can’t centre enact law to ban the legal sale of narcotics,” he posed a question.Speaking on Law and Order front Badal said that newly recruited 50,000 policemen have completed their induction training and they would be put on law and order duties. Unveiling Rs. 1000 crore intensive CCTV plan for all cities of Punjab, Badal said that Punjab Police was procuring new software under which photographs of Proclaimed Offenders would be fed and any PO found roaming in city would alert the ‘Centre Control Room’ ensuing its immediate arrest. He said that CCTV cameras would also help in capturing the images of vehicles parked wrongly, record the footage of overspeeding vehicles and image record in CCTV camera would also use as evidence in cases of chain snatchings and petty crimes on the roads. Focusing on intensifying patrolling in the Rural Areas, Badal said that within 2 months Rs. 52 crore ‘Rapid Rural Response Police System’ would become operational, with police appearing on the scene of crime within maximum 10 minutes. He said that he has already sanctioned purchase of fully equipped 1285 motorcycles, 319 four-wheelers and these vehicles would be equipped on the pattern of Scotland Yard. He said that a separate police control room is being established for Rural Areas and a Zail (Rural Beat) system was being introduced in which a zail consisting of 2-3 villages would be under the direct command of 1 police inspector, who would daily patrol these villages. When asked about slow progress in Shruti kidnapping case, Badal said that a team under IG Bathinda was following certain important leads, which cannot be disclosed at this moment. He said that some arrests have been made and police has recovered the vehicle and assured early breakthrough in the case. He said that no Akali leader has been or would be allowed to meddle in the case. Announcing a statewide recruitment program, Badal said that Punjab Government would soon initiate a massive recruitment program to fill 1.5 lakh posts in the Government departments. He said that SAD-BJP Government made 1.25 lakh recruitments in the Government departments purely on merits and said that these recruitment would also be done in most transparent merit based procedure. Earlier, Badal went around SARAS mela and mingled with the artisans. He said that Punjab was setting up a heritage village in Amritsar, in which artisans from different states would be allowed to showcase their craft. Prominent amongst those present on the occasion included Surjit Singh Rakhra, Rural Development and Panchayat Minister, Mantar Singh Brar, Chief Parliamentary Secretary, former SGPC President Kirpal Singh Badungar, former MP Biba Amarjit Kaur, Patiala Mayor Jaspal Singh Pradhan, Deepinder Singh Dhillon and Shaginder Singh Sunny Aulakh.